The 21st season of the Thunder Legends Series presented by Papa John's Pizza kicked off on a warm and sunny Thursday evening at Atlanta Motor Speedway, as drivers competed in eight separate racing divisions in one of the toughest quarter-mile programs in the South. 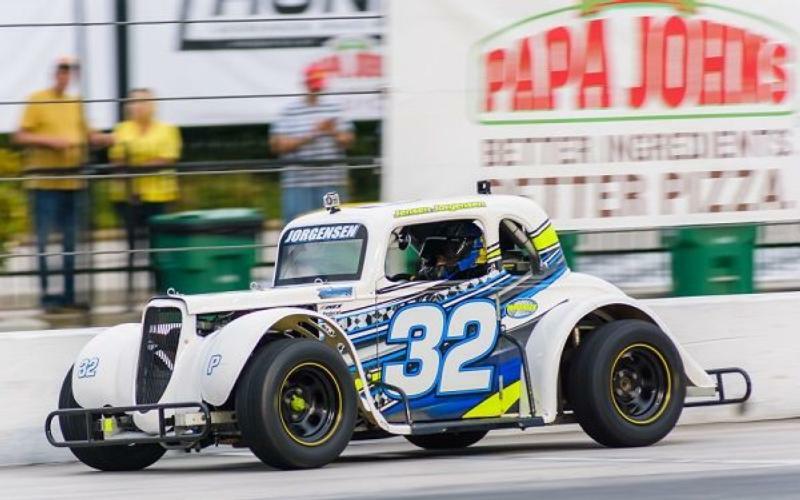 Highlighted with wins by Sammy Smith in the Semi-Pro Division as well as Jensen Jorgensen of Stockbridge in the VP Racing Fuels Pro Division, eight competitors got off to a hot start with Week 1 wins, as the 10-race season got underway. The first feature race of the season saw the rookie bandoleros take to the track prior to the autograph session. Bryson Matthew set a blistering pace from the pole and dominated the feature leading all 20 laps. Matthew held off the field on a handful of restarts to earn a trip to victory lane. Acworth's Lee Brown finished second while Grayson Groves of Canton also earned a podium finish in third. In the Chargers feature, Zac Bacon of Buchanan earned the win in the 20 lap race as he led from flag-to-flag. Bob Anderson of Covington finished second while Chris Carr of Hampton and was third. The largest class of the night saw Valdosta's Ryan Rackley pick up the win in a time shortened race and take the points lead in the Associates Group Insurance Young Lions Division after the first week. Rackley started on the pole while Lawson Ingold of Social Circle was on the inside pole and both starting positions proved to be the difference in the feature. With a handful of cautions and only four laps completed, Rackley jumped out to the lead on the final restart and completed the final two lap green-white-checkered sprint to the finish with the field behind him to earn the win. Ingold was glued to Rackley's bumper for second. Fayetteville's Blaze Crawford finished third. Sammy Smith of Johnston, IA held off a trio of late race cautions to earn the win in the Semi-Pro feature. DJ Canipe of Fallston, NC and David Rochester of Lebanon, TN couldn't take advantage the subsequent restarts as they tried to track down Smith for the lead. The pair battled over the last half of the race for second with Canipe finishing ahead of Rochester for the second spot. Atlanta's Drew Dollar was in the mix until he was part of one of the cautions forcing him to the him to the back of the field and a ninth place finish. Smith, who finished third in the season points battle last year, takes an early lead in the standings with the win. The battle for second was the race to watch in the GRT Racing Driver Development Outlaws between Kenneth Henderson of Alto and Blaise Maddox of Locust Grove. The pair battled door to door down the front stretch as they chased down the leader. Henderson edged out Maddox to finish second as they pair could not reel in Kenny Brady of Marietta. From the outside pole, Brady beat Tyler Newcomer to the inside and dove into turn three to take the lead and never looked back for the win. With passing points in play, drivers were given the option to choose their starting position in the VP Racing Fuels Pro Division based on their qualifying position. Jensen Jorgensen qualified first and chose to start on the pole. He used the inside front row starting position to cruise to an easy win in the Pro Division as he led all 25 laps in the extended premier feature of the night. I've got thousands of laps on this track. I've been racing here for 10 years. I've got the track down. We improved the car and I know the competition is getting stiff. Tonight, the car was magnificent and I know every week it isn't going to be that good. It was the 25th time in his career that Jorgensen found victory lane at Atlanta Motor Speedway in the Thursday Thunder Legends Racing Series presented by Papa John's. "I was wondering where I stood in the list. That's pretty cool," said Jorgensen when he was told about his milestone victory, "Hopefully I can keep clicking the wins on and one day get up to where Skip Nichols [the all time wins leader] is in first. Maybe I'll have the record one day." Rafe Slate of Eatonton, who made his first Thursday Thunder Start in the VP Racing Fuels Pro Division, finished second as has he was able to stay in front of Stockbridge's Taylor Jorgenson in third. Robbie Woodall of McDonough outran Locust Grove's Bill Plemons Jr. on the opening lap and cruised to the feature win in the Master's feature. Plemons kept creeping closer to Woodall, but could not find an opening to slip past the the leader. Woodall used his quick straightaway speed to stay in front of the hard charging Plemons. Covington's Tony Armbruster didn't lose any spots from where he qualified as he finished third. A dominating performance in the Outlaws feature was for not as Suwanee's Carson Ruark led all 20 laps but finished last after being disqualified following tech. Kelley Puckett of McDonough picked up the first place points as he followed Ruark across the stripe to finish the race. Stockbridge's Ryan Younginer moved into second whlie Carter Griffis of Homerville was third. The Thursday Thunder Legends Series presented by Papa John's Pizza continues with Week 2 next Thursday, June 7. Infield admission is available for spectators wishing to watch Thursday Thunder, and passes may be purchased at the Security Command building near the speedway's main entrance. Infield passes are $20, and grandstand tickets for the affordable, family-friendly racing series cost just $5, while children ages 5 and younger are free.